Okieladybug's Scrap N' More: Betsy Bluebell "thinking of you"
I tried to make the ladybug look like it was "thinking" of the girl holding the bouquet. Not sure it came out quite right, but I thought I would explain the green bubbles on the front of the card. The sentiment was cut from Walk In My Garden. I remember how excited I was to get this cartridge because of all the flowers and insects. I have used it in the past quite a bit but it has been awhile since I have pulled out out and used it. I used Core'dinations for the sentiment and sanded it like I did the ladybug to give it some distressed look. I so love Core'dinations for this reason! Plus it cuts great in the Cricut. You can see the Zinger thought bubble a little bit here on the image picture, I colored it with one of the ProMarkers since it was a yellow color and I wanted it to match the card better. I used the blender pen on the flowers and butterflies to get a softened coloring image. Tomorrow will be the last image of this Betsy Bluebell series and will also be the day I post the giveaway for the set of 12 ProMarkers so be sure to come back to see the card and see how to enter the giveaway! CUTE!!! I soo need the markers and the stamps!!! Super cute--great job on your coloring! I can totally tell the ladybug is thinking of the girl with the flowers! The shape of the thought bubble is so pretty the way it squares to the picture then "bubbles"... did you hand cut it? I googled "Fiskars Zingers" but didn't get anything except regular fiskars scissors. This card is soooo pretty! Adorable!!! I have to look for these stamps. Thanks for enabling Okie! I love your card!! I just got a few promarkers....love them!! I hope I get PICKED! 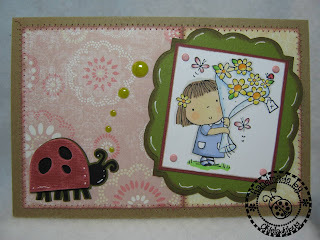 Cute, cute, cute card, Okie and I totally got that the ladybug is 'thinking' about Betsy ... yah, I'm good!! I really like the look of the Core'dinations paper. So far, I've been able to resist the Consumer Crafts sale, but you're making it really hard! Hope you have a great weekend. Another fun Betsy Bluebelle card, no question, your ladybug is having some nice thoughts about her friends! I agree about the core'dinations papers ... it's at the top of my list of favs and so perfect to use with my Cricut too! The coloring on your cards is inspiring me to pull out my markers and get busy. She's so sweet, cute, cute card! Can't wait for a chance to win the promarkers! 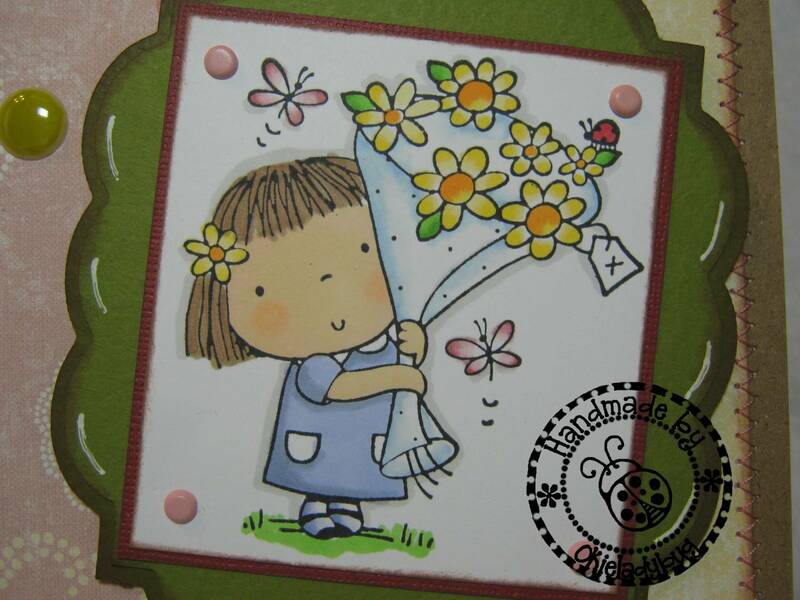 I hope you are happy....I broke down and ordered these stamps! I totally got what the ladybug is thinking. Fabulous!! Gotta quit coming to your blog. I really need those stamps and pro-markers. Darn. This card is so cute! Love how you colored it. Okie -- where did the cut come from behind Betsy Bluebell (the green part?). Songbird?